After spectating and volunteering at a few local races, I spent this past week again familiarizing myself with huffing and puffing it in the mountains of Colorado. 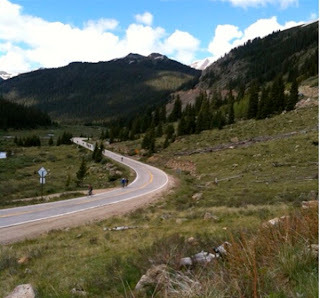 One of the climbs I rode was Squaw Pass, an easy to reach climb in the foothills near Denver. I soon remembered what climbing on a bike at altitude felt like. A few miles left to go into the long winding 19 mile climb to the sort-of finish at Echo Lake Lodge, I could feel the altitude. The lodge is only at 10,600 ft, some cyclists continued up to the summit of Mt Evans at 14,240 ft. I did not. I was given some free jelly beans by a Jelly Belly team car and it's three team riders who passed me fast and steady on the climb. I began to wonder how many of the pro cyclists will be in Colorado this week to acclimate, post Tour of Utah and before the USA Pro Challenge. I feel the altitude going from 5280 ft where I live, to 9000 ft where I ride, visitors to this state must really feel it. Lots and lots of information about Altitude and Acclimatization on Tradgirl. Climbers often know best about performing at altitude. For cyclists planning to visit Colorado this summer, remember you will feel the altitude even at rest, or trying to rest - especially trying to sleep. The old sleep high train low, became train high sleep low, but you will have no choice if you are sleeping overnight in these towns. Read about the signs and symptoms of altitude sickness. One last note about cycling in Colorado - we are chock-full of false summits and false flats. Even though a road may look steep to the eye, you might find yourself clicking into an easier gear, at other times you will beat yourself up mentally thinking your legs are no good when the road appears to be flat. This is because the Continental Divide rules all in Colorado and the engineering of our roads does not necessarily equate appearance to effort. 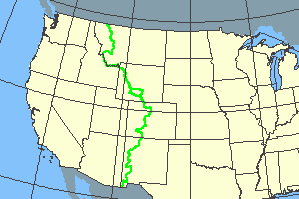 If you are heading west, or straight east, the feeling of exertion will be intense. If the road turns at all north or south, the grade may appear steep but the effect on a cyclists legs is much easier. If you know you have a steady climb in the direction of the Great Divide, sit in, it could be a long glorious climb up. For more information about the bike climbs in Colorado read: Recommended Reading: Guide to Climbing The Complete Guide to Climbing (By Bike) in Colorado.